Swimming with JBT in mind. 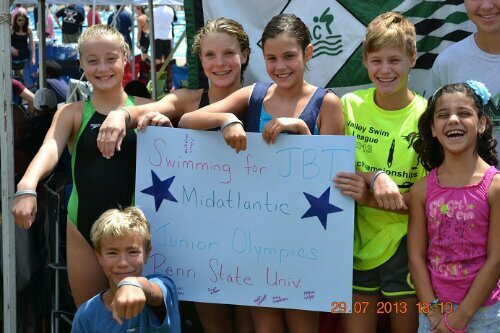 The EMAC (PA) Junior Olympic swim team was inspired by JBT last weekend at the Mid Atlantic Junior Olympics at Penn State! Swimmers Nick, Meghan, Katie, Paige, Maggie and mascot Olivia are all rooting for John!! Keep up the good work JOHN!! This entry was posted in Sending Positive Vibes Posts, WearJohnBradley Posts. Bookmark the permalink. ← Thinking JBT in the southern hemisphere.